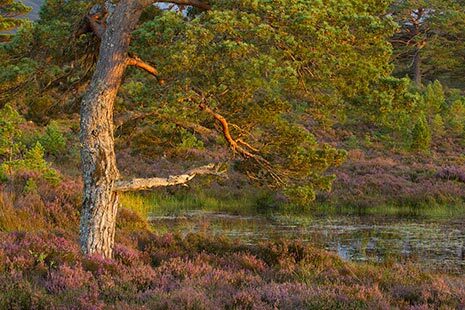 The work of generations of land managers has produced the blend of different habitats and landscapes we see in the Cairngorms National Park. These landscapes are mainly the product of human action. Managing for biodiversity is not something additional to the work of many land managers, but part of their everyday activity and has led to the rich mix we have here. Whilst the National Park is undoubtedly one of the best areas in the UK for biodiversity, more needs to be done to ensure it thrives further in the future. We need action that ensures no biodiversity loss andencourages land management practices that enhance as much as they can. Cairngorms Nature is leading the way in helping land managers deliver positive, productive land management which will benefit nature while also enabling for a thriving business. Help and advice on the management of habitats in the Cairngorms National Park is available from the Cairngorms Nature Team. For further info on the specific habitat types, click on one of the tabs above.